Anything added to a text document that conveys an extra information. Markup languages are the languages that build the web.. That is, if we want to display a word in some format like bold,underline... we use the corresponding markup tags for that particular word. Thus markup describes exactly how the document should appear on the screen or during in report processing. Markup is being used extensively not in computing world but also in electronic documents. 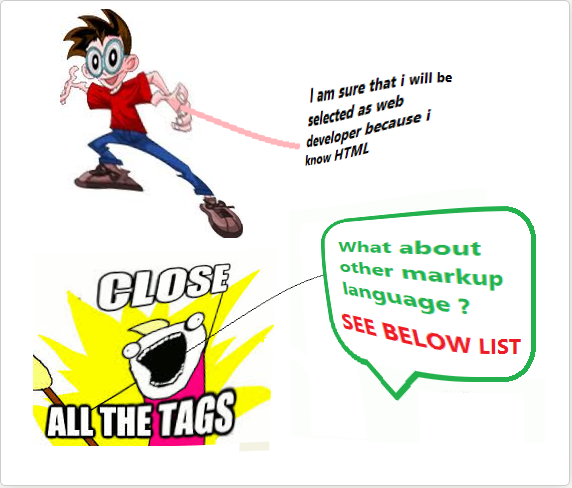 There are two types of markup and hence there exists two types of markup languages. They are procedural and generalized. - Procedural markup is typified by its use in typesetting and publishing systems, including word processors. 1. The elements have logical names, rather than expressing detailed formatting instructions. For example, an element H1 is being used to mark up text that is intended to be a first-level header. 2. Software applications that read documents marked up using a GML are free to present them as they see fit, using formatting rules for particular elements that are either defined internally, or specified elsewhere. When displayed in the screen, the H1 element could be associated with a particular combination of font size and weight. GML elements usually involve both start and end tags so that the original content is fully contained inside an element. Also there is no hint about how this document should be presented. That is, the web browsers are free to reflect the meanings of these elements. The most commonly used generalized markup language is HTML for web documents and WML for mobile contents. Generalized Markup Rule-sets Each GML has its own elements, its own rules, and its own particular area of application and in order for the language to function properly as a language, those must all somehow be defined. GMLs are themselves written using Generalized Markup Rule-sets (GMRS), also called meta-languages. The two famous meta-languages are Standard Generalized Markup Language (SGML) and the Extensible Markup Language (XML). In a way, XML is a subset of SGML and WML is derived from XML. Recently another markup language called as Extensible HTML (XHTML) for future web publishing came out. XHTML is a reformulation of HTML 4 in XML. XHTML has to be designed to avoid some undesirable features of HTML. Though all these features can be accomplished easily using XML, XHTML has been formulated for keeping the large investment made in HTML.